Dr Chimphango is an agricultural botanist involved in legume research at Capetown University. 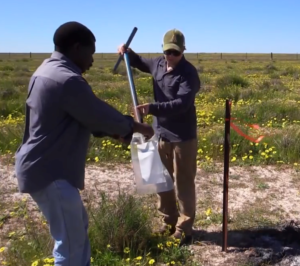 With Crawford Fund support, he visited the Centre for Rhizobium Studies (CRS) at Murdoch University to study the program of legume domestication there. Rhizobia are bacteria in the roots of the legume plant group. The bacteria play an important role in making the nutrient nitrogen available in the soil for plant growth. Legumes from South Africa have been a major part of the CRS program since 2004, so Dr Chimphango was exposed to a decade of learning in this regard. The training covered several theoretical aspects of rhizobium technology. Importantly, the techniques of rhizobiology, which are critical to successful legume domestication, were emphasised. Dr Chimphango also attended field days, participated in research projects and presented a paper about his work in South Africa to Australian scientists. “There were some unexpected outputs including increased networking with other scientists in the CRS program and external to the program. For example, the close interaction with the CRS scientists … increased my networking group of pasture research scientists with a wealth of knowledge and expertise in pasture production in Western Australia. Interaction with farmers during field days and field activities was a great experience. The farmers were very enthusiastic with interest in pasture research activities and incorporating new pasture species in their farming systems,” says Dr Chimphango at the conclusion of his visit. “Dr Chimphango has embraced the ideas of developing grazing legumes from his indigenous African flora. As a consequence, our own program of legume domestication will be enriched through continued dialogue and exchange of materials (legume and rhizobium),” says his mentor Prof John Howieson, Research Director Crops and Plant Sciences at Murdoch University.